One year before the Olympic Sailing Competition the sailors showed their mettle on the race tracks that will be used at Rio 2016. Many of the test event medallists will win an Olympic medal in one year's time, highlighting the importance of sailing's test event. Sailing, as a sport, depends on a number of factors and relies on the conditions that are prevalent at the time of asking, from wind speed, wind direction, tidal patterns and much more. These can change in an instance and the 326 sailors from 50 nations will walk away with key knowledge, data and lessons learnt as they spend the next 348 days preparing for what is to come. 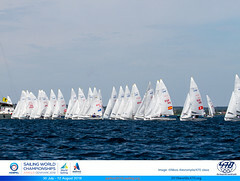 The Men's and Women's 470, Finn and Nacra 17 fleets drew the competition to a close on the Pão de Açúcar race track. With Christ the Redeemer looking over the racing area and Sugarloaf Mountain standing tall the sailors enjoyed another southerly breeze ranging from 8-12 knots ensuring great racing. It was every man for himself in the Men's 470 with minimal separation between the top five sailors heading into the Medal Race. The advantage was in the hands of Sime Fantela and Igor Marenic (CRO) but the leading teams all had a shot at gold. Every team stuck to their own plan and it was Australia's Mat Belcher and Will Ryan who came out on top to take a second Olympic test event gold. Throughout the race the gold medal could have gone a number of ways. Sofian Bouvet and Jeremie Mion (FRA) put themselves in the driving seat by grabbing the lead and maintaining it to the finish. Belcher and Ryan knew what had to be done and managed to push ahead, obtaining some daylight between themselves and the rest of the fleet in second. Pushed hard by Switzerland's Yannick Brauchli and Romuald Hausser, the Australians maintained their spot and as they came through in second, they watched the Croatians come through in eighth which handed them gold. "This is a really good stepping stone for us," said Belcher. "We had a really tough regatta in the beginning. 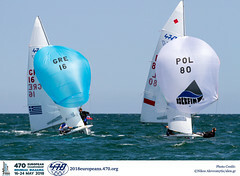 We felt we were sailing really well and the disqualification halfway through put a lot of pressure on Will and I. It was nice that we were able to overcome that and come away with a win. There's a lot of work to do but we're pretty happy with how we're going. "For us the focus is about next year. Every day, every week and every month we're training and it's all about next year." Ryan added, "We're really happy with how it's going and hopefully in one year's time we can repeat what we did today." 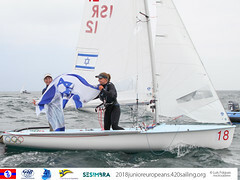 A French race victory promoted them to silver whilst Fantela and Marenic picked up bronze, finishing a single point ahead of Onan Barreiros and Juan Curbelo Cabrera (ESP). Anne Haeger and Briana Provancha (USA) claimed gold in the Women's 470 after overnight leaders Hannah Mills and Saskia Clark (GBR) were penalised on the race track. The advantage belonged to the Brits going into the race but they had to do penalty turns on the race track and they slipped to the back of the pack where they remained through the duration of race. The Americans finished fourth in the Medal Race, enough for them to seal gold by seven points over the Brits. "It was awesome," Provancha expressed as she began to describe the Medal Race. "We were really trying not to be over the line. Luckily for us the British got themselves in a bit of a situation early on in the race and it put them quite far behind. From there we were in defence mode and things worked out well for us." Haeger and Provancha have always been in the mix for medals in the Women's 470 and in many cases it's been close, but no cigar. That phrase has been eradicated from their name now and Haeger was beaming with joy on Flamengo Beach at the conclusion of the day, "A takeaway is that we can actually do it. This is our first major regatta win and I'm so proud of her [Briana] so it's within our grasp and we can hopefully come back next year and do the exact same thing. "[The level in the Women's 470] is getting higher, higher and higher and that's why this win kind of solidifies it for us that we are right up there. Even though people are taking steps we're right there with them. It's an exciting time." New Zealand's Jo Aleh and Polly Powrie held on to bronze with a Medal Race second.